Lanterns will glow outside Hawaii's many Japanese temples during the summer Obon season as Buddhists observe the tradition of honoring the dead through ritual, music and dance. Obon literally means "lantern festival." The mellow, old-fashioned lights are intended to illuminate the path of the spirits of ancestors as they return in this season. The spirits are honored with offerings of flowers, food, prayers and incense in temple rituals and on family altars. But the popular expression of remembering the dead is the bon dance. This form of sacred dance dates back 2,500 years to the founder of Buddhism, Shakyamuni Buddha. For Hawaii Buddhists it is also a celebration of more recent history. Japanese immigrants established temples in plantation villages, the center of their social, cultural and spiritual life. Generations of people who have moved away still return to the rural temples during Obon season. Bon dances are so popular that the season is stretched to last all summer long. Temples take turns on successive weekends, erecting fundraising food booths along with the "yaguro" tower, the stage for taiko drummers, singers and disc jockeys spinning Japanese folk songs. The experience has been embraced by island residents regardless of religion or ethnicity. Dozens of people bring out the happi coats and join in the storytelling step dances that relay simple tales of rural Japan and early plantation days in Hawaii. 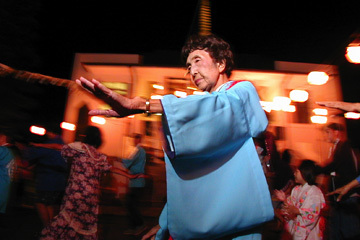 Misao Horimoto dances while circling the "yagura" tower at the Shinshu Kyokai Church Bon dance. The Haleiwa Jodo Mission is the only Oahu temple that completes its Obon observance with a Toro Nagashi, lantern floating ceremony. More than 1,000 lanterns will be set adrift from the shoreline next Saturday in a tradition the rural temple began more than 30 years ago. A flashier, commercialized version of the Toro Nagashi, professionally staged at Ala Moana Park and broadcast by satellite to Japan, is sponsored each Memorial Day by the Shinnyo En Hawaii lay Buddhist organization. "The spirits come back and dance together with us," said the Rev. Koji Ezaki, of Haleiwa Jodo Mission. "In the Toro Nagashi, the spirits of the deceased are going back to the land of Buddha, and we light their way." Names of the dead are inscribed on the lanterns. Most of the lanterns have been reserved, but 200 will be sold at the Saturday event. Members of the 100-family congregation constructed the lanterns of wood and rice paper last weekend. Only biodegradable materials are used because they are expected to disintegrate at sea, said Ezaki. "It is a Buddhist principle to take care of the environment. We have to live with nature and appreciate nature." The Haleiwa temple determines the date of its Obon event by consulting the tide calendar, selecting a date when an evening high tide will carry the lanterns out to sea, Ezaki said. The mission at 66-279-A Haleiwa Road is on the point of land beyond Alii Beach Park. The bon dance will begin at 8 p.m. Friday and Saturday. The Toro Nagashi will begin at 9 p.m. The events are open to the public. Traditionally, the lantern-floating is the finale of the Obon observance, guiding the ancestors back to the spirit world, said retired Honpa Hongwanji minister Alfred Bloom. In Japan the Toro Nagashi is often on a river. "There is the concept of carrying away impurities, so sending these ancestors back also has the aspect of a fresh start for the living," Bloom said. He said the concept of dancing for the dead is based on a story about a disciple of the Buddha named Mokuren. The monk had a vision of his dead mother in the realm of hungry ghosts, starving there because of her greed while alive. Mokuren asked Shakyamuni Buddha how he could relieve her suffering. The Buddha told him to offer food to monks returning from a retreat. His mother's spirit was freed by his good deed, which led Mokuren to dance with joy. The idea caught on, and the rest, as they say, is history.